This malicious hoax flier has been letter-boxed in parts of Fremantle. It pretends to be by Socialist Alternative who it says are "disillusioned members of Socialist Alliance Fremantle". It condemns the City of Fremantle for inviting Waleed Aly on the grounds that he is a "child molester" and committed "violent acts against women". 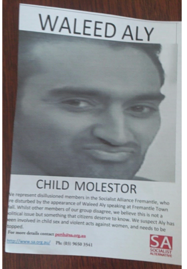 Socialist Alliance member and Councillor at the City of Fremantle Sam Wainwright called the flier, "A truly vile attempt to smear Waleed Aly's name in the minds of those are naive enough to believe it, and an attempt to associate Socialists with the claim in the minds of those who have not taken it at face value. It further treats the survivors of child sexual assault with contempt by treating this serious issue as play thing." While it's not known at this stage who printed the flyer, it is known that a far-right nationalist outfit called the True Blue Crew have called on their supporters to harass Waleed Aly when he speaks at the Fremantle Town Hall as part of the Fremantle Festival at 4pm on Saturday 29 October. They claimed that Aly was a "supporter of terrorism". Wainwright continued, "This is a disgraceful attack on Aly and many good people who stand up to racism wherever they find it. It's a toxic combination of hate, Islamaphobia, racism and lies." He added, "As a survivor of child sexual assault myself, it is completely revolting to see some low-lifes manipulate this issue to promote their toxic agenda. I call on Fremantle people to express their welcome to Aly. Attend the meeting if you can, come down to the Town Hall to show your support." Wainwright concluded, "I ask people who have received this flier to forward any information they have about its distribution to me and to the police. It raises issues of defamation, identity fraud and incitement ."